Whether it’s your primary space to do business or a place to work on side venture or a hobby, a home office should encourage creativity and productivity. Thanks to these practical home office ideas from Decor Aid, creating a functional home office will be anything but work. As you begin to design your home office, you’ll want to think about how the room will be used. Is it primarily your work space or will it be used by other members of the family for homework and surfing the web? If this is your place of business, will you need space for client meetings or to collaborate with other professionals? The answers to these questions will help you figure out the best layout for your home office. Next consider your work flow and the factors that make you the most productive. 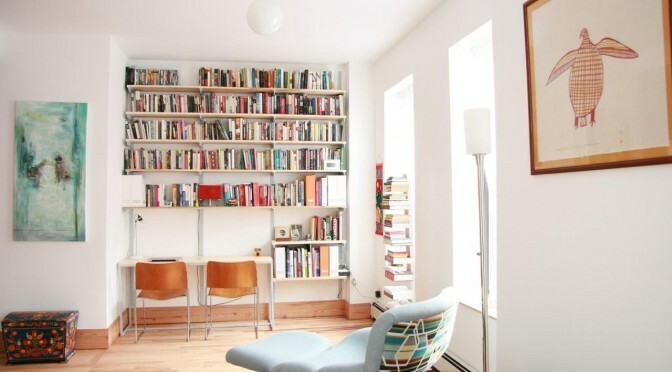 Perhaps you need plenty of desk space to spread out documents, easy access to a printer, or a comfy chair for reading. Add art and objects that inspire creativity. A large corkboard can keep important reminders in sight and provide a place to tack beautiful images and encouraging quotes. Wall color can make a big impact in a home office. Choose a color that puts you in the mood to work, whether it’s an energizing bright orange or a relaxing pastel blue. Gray wall paint is a popular interior design trend in the home office as well as in the rest of the house. Another home office essential is light. You’ll want to make sure your work area is well lit in order to prevent eye strain, particularly if you work during off hours like the evening or late at night. A desk lamp or overhead pendant work well in most spaces. If you have a built-in desk, save room by installing lights underneath cabinets or shelving. One of the benefits of a home office is that your workspace doesn’t have to look like a sterile cubicle. Choose furnishings that reflect your taste and, most importantly, that are comfortable and functional. The primary piece of home office furniture is the desk. If you’re carving your home office out of a corner (or even a closet), you can save space by building the desk into the wall. A business that involves paperwork may need a home office desk with plenty of storage included, while a web-based company can opt for a more minimal design. You’re going to be spending a lot of time in your office chair, so it’s important to choose one that’s comfortable. You also don’t have to limit yourself to traditional office chairs. As long as they provide enough support, a side chair or armchair are stylish alternatives to the traditional adjustable office chair. The last office design essential (besides a computer) is storage. Keeping reference materials and files organized in bookcases and filing cabinets will save time in the long run. And don’t forget to invest in solutions to keep electronic under control, like built in power strips or cord organizers. Not every home has the square footage for a dedicated home office. If you’re limited to a corner of the living room or the kitchen for a small home office, it’s important to create a space that’s just for work. A screen or sliding door can hide your desk when you’re off the clock. Another small office idea is an armoire that can function as a self-contained workspace. A home office may also need to serve a dual purpose. Add a daybed or install a murphy bed to create a space that can double as a guest room. Decor Aid’s talented team of interior designers are office experts. (To see proof, tour their own chic office space.) The company’s home decorators have years of training and experience and can assist with any size project, whether you need a space to launch your business or a small space to pay bills and write e-mails. Let Decor Aid’s interior designers bring you the best home office ideas and handle everything from furniture shopping to testing paint samples to designing custom built-in storage. With Decor Aid’s help your home office will be a functional space that reflects your style and makes going to work a pleasure.